Glass and in particular glass manufacturing is an age old process. Who, how or when glass was discovered is still a mystery to this day. Glass is a material which plays a vital role in our day to day lives. Both for domestic and industrial purposes. The defining properties of glass include transparency, and resistance to chemicals. This makes it popular for a range of different applications. Whilst other undesired characteristics such as its brittleness and heavy character makes it unsuitable for others. Careful consideration is always important before choosing to use glass. The uses of glass vary and each and every year more innovations come to light which use glass. Most types of glass are manufactured from natural raw materials which are known as “batch” in industry. However each type has its own slightly unique process. In a standard industrial glass manufacturing process, materials are stored in huge silos and include sand, soda ash, limestone and often iron and carbon. Which help to add colour to the mixture and later form coloured glass. Common examples of coloured glass include green and brown glass bottles. In the next step of the process, the batch is fed into a melter furnace continuously and blended together. Transforming the batch into molten liquid glass over time, which will later be moulded into its desired shape. The manufacturing process takes place at a high temperature. It is no surprise that the intense heat (up to 1500°C) and 24/7 operation means that the glass furnace requires a rebuild every 8-10 years or so. Glass furnaces play a vital role in the glass manufacturing process. Melter furnaces are constructed which use fossil fuels such as oil and gas to power them. Electricity itself can be used. However there are few all electric melter furnaces used in industry, and they are typically used on special glassware. The most common use of electricity in glass manufacturing, is to “boost” the temperature inside a furnace if the combustion of oil and gas is not hot enough to reach the desired temperature. Again, this is not a common occurrence. In order to correctly regulate the temperature of the melting process and protect the furnace. Furnaces contain a number of high temperature sensors including crown, melter bottom, sump bottom, riser sidewall thermocouples and so on which help to protect. We regularly supply temperature sensors designed specifically for use in glass melter furnaces. It can 24 hours to turn a batch of raw materials into the molten glass, the molten glass is then transferred down a throat where it is poured into a forehearth where it can be conditioned. At the throat, temperature sensors are used to check the temperature of the molten glass, and in the forehearth tri level thermocouples can be used to check the temperature at various points. Glass level electrodes are also used to check the flow of homogeneity of the liquid. After the glass has been conditioned and the temperature of the process has been thoroughly controlled, the glass is ready to be moulded into shape and is poured, often by automated machines into the desired mould. Glass can moulded in different shapes and sizes depending on its intended purpose. In glass bottle manufacture for instance, a glass gob forms a parison in a blank mould. After which either the Blow-Blow moulding method or Press-Blow can be used to form the exact shape. The finished glass product is then removed and transferred to an annealing oven where the container is coated with tin oxide for added strength. The bottle cools down gently before being safe to use and inspect. After inspection, the bottles can then be packaged and send to the customer. We hope you find this information helpful. We regularly work alongside glass manufacturing companies and our temperature sensors can be found in glass works all around the world. Our specialist knowledge and experience of the industry puts us a class above the rest. 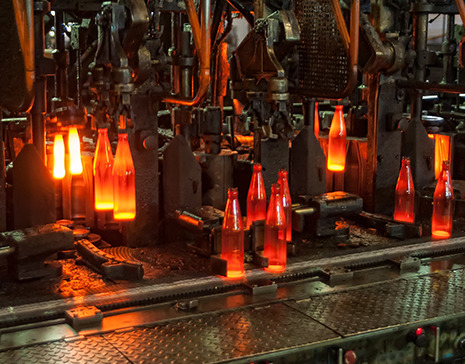 If you are interested in learning more about glass manufacturing and how we can help to design your custom temperature sensors for industry then give us a call today on 01246 261999.